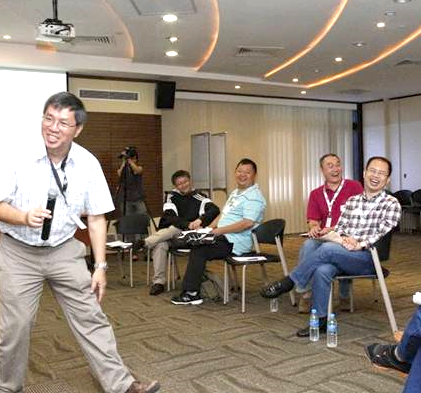 Fathers enjoying one of the many moments of laughter together during the Coaching for Father workshop. How does one live out what one teaches? Where does a coach gain inspiration and wisdom from to teach and guide others? Dads for Life speaks to Edwin Choy, certified family coach and founder of the Centre for Fathering in Singapore, on what inspires and drives him in his advocacy for meaningful fatherhood. Together with my wife Lay Koon, we have 4 kids: Nathaniel who is 15, Brynna who is 17, Ryan who is 21, and Cailin who is 23. What is your relationship with your 4 children like? I have a fairly close relationship with them. They go to their mom for daily needs but come to me for recreational needs or advice for their future. Each one is unique, and I relate to them differently. My eldest (Cailin), who I spent a lot of time with when she was little, started work a year ago. We talk about career or the future, as well as relationships. My second (Ryan) and I share a lot of interests together – nature, scuba, cycling and music. We went on scuba trips and even stayed in a national park together – just the two of us. My third (Brynna) is probably the closest to me now. I connect with her in a way that allows her to feel at ease talking to me. She talks mostly to me now, despite being an introverted girl. My youngest (Nathaniel) is closer to my wife as they spend much time together. Nonetheless, we’ve gone on scuba trips together (just the two of us) and being the youngest he tags along when my wife and I go on trips together. I taught each of them almost the same skill sets from young: firstly to swim, then ride a bicycle, and then roller blade. I taught Ryan and Brynna how to play the guitar, and they both play much better than me now. Each time they complete their O levels, I will use my coaching skills and the Myers-Briggs Type Indicator to help them make choices about their most suitable field of study, according to their personality and temperament. Over all, they feel comfortable approaching me, and we have more of a warm relationship than one of fear. Do they influence your ideas on family therapy? How so? Very much so! I learn about family relationships mostly from them, as well as from the mistakes I’ve made. Children are great teachers. They tell you when they are upset with you, when you don’t keep promises, are too harsh or are not being fair. I get a strong sense of what is helpful in bonding the family from the interactions. The joy, the laughter, and the many shared moments warm the heart greatly. They also teach me how to sacrifice, to be trusting, encouraging, patient and honest; especially when confronted by their innocent, honest questions! 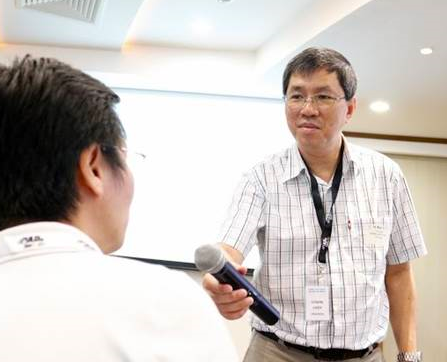 Edwin Choy’s Coaching for Fathers workshop frequently guides participants to reflect aloud on their accomplishments as fathers. Do they affect the way you train and counsel parents? One cannot counsel parents without experiencing parenthood. The kids humble me because they reveal my naivete when I try to apply “techniques” that do not work. That is the key principle in Solution Focused Coaching: “When something is not working, stop!” When that happens, I will just go along with my intuition, try a bit here and there to discover what is helpful for each kid. There is no expert knowledge that will fit all kid types. There is only experience and humility to learn and sometimes unlearn. In my counselling, I adopt the Solution Focused approach, which is a non-expert therapy. I help parents reflect on their own parenting experiences and highlight their accomplishments (no matter how small). I do not tell them what to do. On the occasions when I do experience success in Solution Focused Coaching, I can see parents light up happily when offered appropriate and sincere compliments. When parents are faced with disappointments however, using Solution Focused conversation can help them refocus on their progress rather than on failure. Please share with us a little more about the idea of “Father as Coach” and the Solution-Focused Coaching approach. Of all the roles a father takes on, as provider, protector, recreation co-ordinator, the role of coach is most suited for fathers of teens. Teens are at that stage in life, where they prefer not to be spoon fed or told what to do. They want parental support, but also want to do things their way. The “Father As Coach” workshop imparts coaching skills that help fathers enable and affirm their teens to make their own choices based on strengths and resources. The principles and skills are easy to understand, quick to learn but takes a while to practice. The challenge lies in changing a mindset from one that is problem focused to one that is solution focused. What was your relationship with your own father like? How did he influence you and your current choice of work as a family therapist? My dad was not as responsible as I would have liked him to be, but he did his best based on what he knew. He took to drinking to resolve his problems, and this created many problems for the family. We were relationally distant. We hardly talked till his aging years, when he was more dependent on us because of his health. He influenced me by giving me clarity on what not to do as a father. I have developed a passion to help fathers make right choices towards building family bonds, and helping secure children with a father’s love and protection. Share with us some of the feedback you have received from the Father as Coach workshops. Participants enjoy the sessions, find the principles practical and are inspired to practice these at home with their children. They appreciate the Solution-Focused approach of coaching and communication as it empowers them to teach their children to seek their own solutions through self-reflection. It’s a whole new dimension to parenting which participants feel make them more effective fathers, and better communicators in the family.